Your yard, like your home, should be an enjoyable asset for the whole family, with spaces for kids to play, adults to hang out and older people or anyone with limited mobility to access. Landscape design for all ages is a common theme in our public landscapes, since universal accessibility is required by federal law, but there’s a lot you can do to bring the same principles of universal design to your home landscape. Here are helpful tips on how to plan a multifunctional yard that’s useful for all. When we think of family-friendly landscapes, kids are the first thing to come to mind — and for good reason because a landscape that children will enjoy is quite different from one adults will enjoy. Kids want spaces to play, run, explore and be creative. Adults want places to relax, read a book, do yoga, garden or drink a beer with friends. And multigenerational gardens that are inclusive for older adults layer on another set of priorities for easy and safe access. Create spaces that serve all ages. Patios, lawns, decks and porches are spaces that everyone can use. Here’s a basic checklist to make sure these general-use areas are accessible to all. Don’t include plants with poisonous parts near your highest-use areas. Kids and pets try to eat all kinds of things, so keep poisonous plants out of their reach. Provide slip-resistant surfaces free of tripping hazards that are easy to walk on and can serve as a play surface for young children. Multipurpose outdoor surfaces include outdoor rubber flooring, wood decking and concrete. 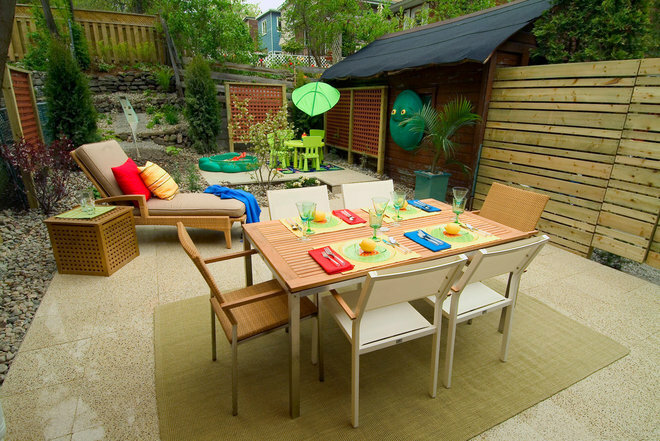 Provide different types of sitting areas if you want to host outdoor meals. Older adults will especially appreciate a sturdy chair with a good backrest. Kids, if you can get them to sit down at all, do great on backless benches or in kid-size chairs. Provide well-lit paths so that people with limited vision can see where they’re going. Provide natural areas for kids to play. Encourage kids’ imagination outdoors by creating wilderness play areas with a variety of natural materials for them to explore and experiment with. Plant a small grove of trees or a sunflower forest, or design game spaces that allow for different kinds of play: lawns, giant checkerboards and sandboxes. 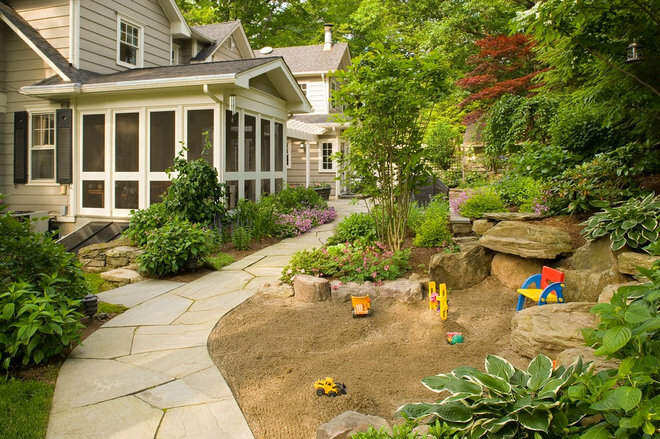 In this image, a sandy play space integrates with site rocks as a natural play area. A natural area as a playspace has an advantage over a stand-alone, off-the-shelf product because it’s more easily folded into an overall landscape design. A plastic swing set, for example, will degrade over time and may eventually be thrown out once the kids have outgrown it. An integrated natural playspace will improve with age. Define multifunctional areas. Think about how your landscape can have multifunctional areas that act as flexible spaces and do double duty. Your yard doesn’t have to be huge to provide enjoyable space for everyone. The backyard shown here is a great example of a multifunctional space because it has flexible-use garden areas with different types of surfaces. 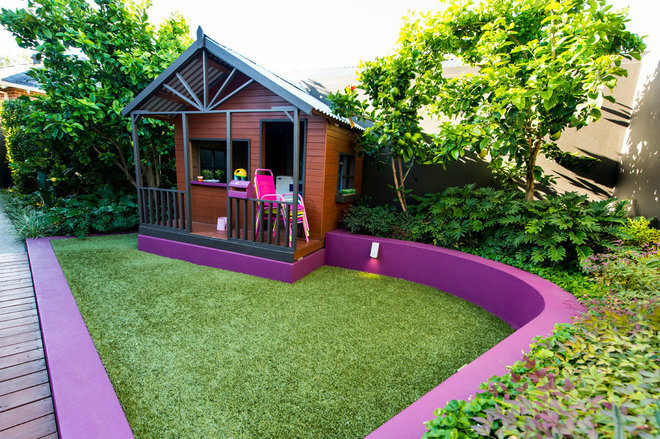 The artificial lawn in front and the shed itself can be used as playspace for kids. On top of that, I can see the adjacent walkway as a place where an adult can set up a chair to watch the kids and read a book. Create specific areas for older adults. Older adults want to play outside too. Create sitting areas with great views, paved paths for walking or raised garden beds so that kneeling isn’t required to tend the plants. 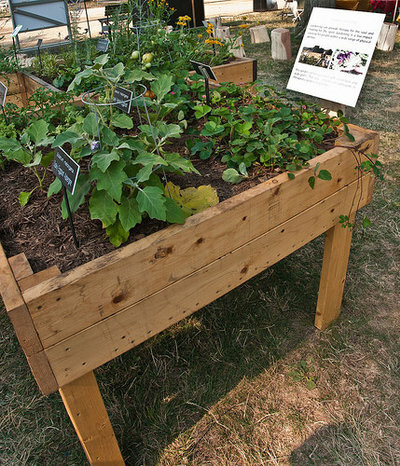 There’s also a wheelchair-accessible garden called a tabletop garden: a raised bed elevated to table height with room underneath for a chair. This allows someone to garden while sitting down, and it’s an amenity that’s being added in parks and playgrounds as wheelchair-accessible space. Design spaces with different types of surfaces. If you don’t have the time or budget to redesign entire spaces for play or wheelchair access, the easiest option is to be thoughtful about the different surfaces and where you use them. Not everything in your yard has to be programmed; sometimes it’s best to provide the surface and let your family make the space their own. 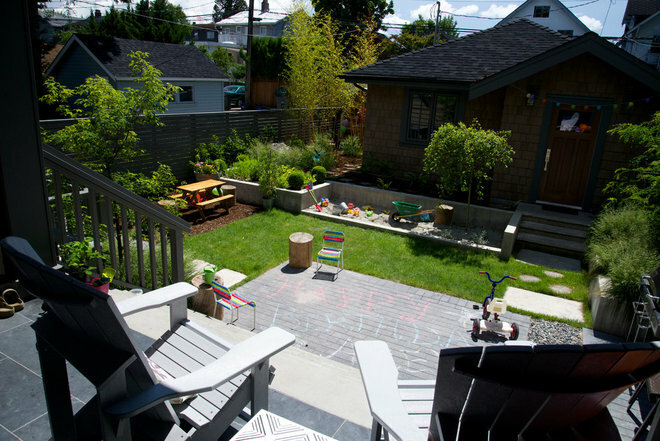 Here, a paver patio becomes a chalk-drawing surface with a lawn for games and a defined sandbox beyond. The adults can supervise from their perch on the porch. 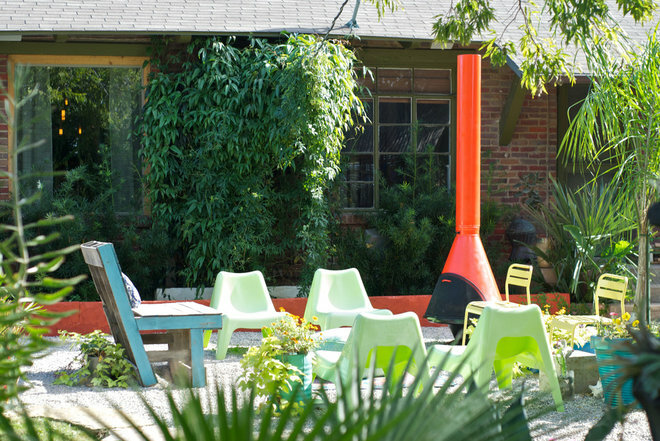 This is a great example of providing a variety of surfaces and multipurpose areas in a beautiful small yard. Provide ramps for ease of access. A ramp that makes it easy to move between different outdoor levels or from indoors to out will be appreciated by those with limited mobility or who use canes, walkers or wheelchairs to get around. 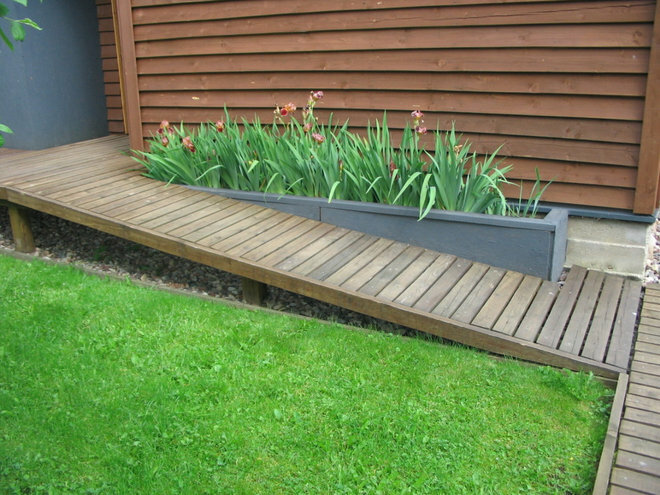 Ramps can connect the home’s entry to a patio, or they can be designed into a sloped backyard for easy access throughout the landscape. A ramp should be sloped no more than 8 percent for people in wheelchairs or those walking with the help of a cane or walker to safely navigate. If you want a ramp that coordinates with your home, like the one pictured here, consult a building architect or general contractor. Consult a landscape architect about how to design and shape the ground for sloping pathways throughout your site. Include stair landings and handrails. Be sure to include a handrail wherever the grade change is too steep to allow for a ramp and stairs must be used instead. An easy-to-grip handrail along the entire stair flight will be most useful. Note how the handrail pictured here begins at the very bottom of the treads so that it can be used to steady oneself at the start of the climb. If you have an extra-long flight of stairs, include a landing as a spot to rest midway through the climb. 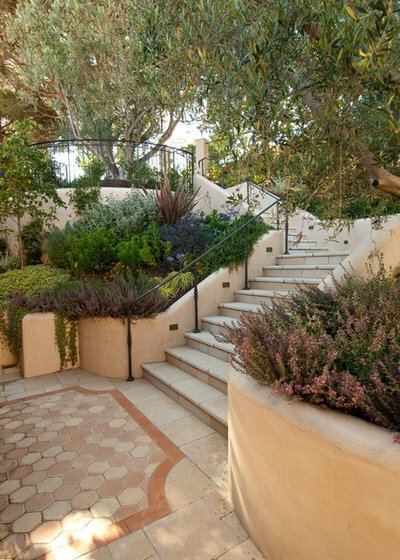 The landing pictured in this design occurs where the staircase forms an L, using space efficiently and making for interesting planting beds that flow with the staircase.